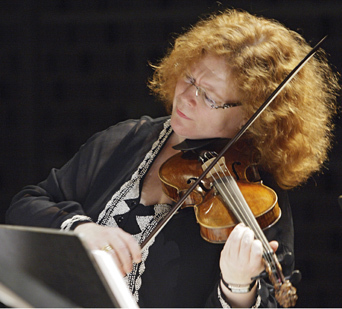 Sirkka-Liisa Kaakinen-Pilch is an unusually versatile violinist. Though she plays music of every era, the emphasis in her repertoire is on the 17th to 19th centuries. She also plays the viola and viola d’amore and leads the orchestra or conducts from the front desk. After completing her studies at the Sibelius Academy (Yoshiko Arai, Jouko Heikkilä, Kaija Saarikettu) Sirkka-Liisa Kaakinen-Pilch has studied, among others, under Ana Chumachenko and Baroque violin with Monica Hugget and Lucy van Dael. Kaakinen-Pilch has been active in several orchestras and ensembles, including Avanti!, Finnish Baroque Orchestra, Helsinki Baroque Orchestra, Battalia, Orchestra of the 18th Century (Frans Brüggen), La Petite Bande (Sigiswald Kuijken), Amsterdam Baroque Orchestra (Ton Koopman), Concerto Copenhagen (Lars-Ulrik Mortensen). She has also worked for over a decade as leader of the Collegium Vocale (Philippe Herreweghe). Kaakinen-Pilch is nowadays in great demand as a leader of countless renowned early music ensembles and orchestras, performing music of the Baroque and of the Classical period. Her solo repertoire includes such works as the 16 Mystery Sonatas by Biber, the Bach Solo Sonatas and Partitas, and solo violin works of the 16th and 17th centuries. Kaakinen-Pilch has been a Professor of chamber music at Stavanger University, and a Professor of early music at the Royal Danish Academy of Music and the Bremen Institute of Arts. Currently Kaakinen-Pilch works as Professor of early music at Cracow Music Academy and teaches violin at the Tampere University of Applied Sciences. She is also a teacher of Baroque violin at the Sibelius Academy, works as an instructor for the European Union Baroque Orchestra and teaches in several master classes. Ondine released two CDs by Sirkka-Liisa Kaakinen-Pilch during autumn 2013: Sonatas and Partitas by J. S. Bach for violin solo and Orchestral Suites by Ch. Graupner. On this second CD she is leading the orchestra and playing viola d’amore as one of the soloists. In 2014 two further recordings were released: one with Trio Sonatas by Ch. Graupner (viola d’amore) and a double CD with H. I. F. Biber’s Mystery Sonatas. Together with Tuija Hakkila she has recorded the Violin Sonatas of Thomas Byström. Her most recent recording with Ch. Graupner’s Epiphany Cantatas was released in December 2017. In this recording she is leading the Kirchheimer BachConsort and playing viola d’amore.